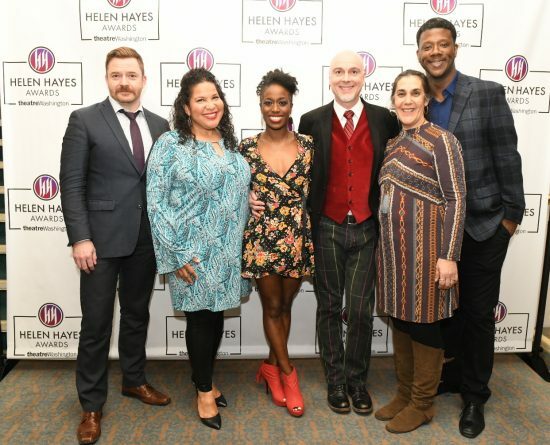 Will Garshore, Rayanne Gonzales, Felicia Curry, Rick Hammerly, Kathryn Chase Bryer, and Kevin McAllister presented the nominations for the 2019 Helen Hayes Awards. Photo by Clarissa Villondo / Karlin Villondo Photography. On Monday, February 4, 2019, at a celebration honoring theatre excellence on stages across the Washington area, theatre artists, administrators, patrons, and special guests gathered in the National Theatre’s Helen Hayes Gallery for theatreWashington’s announcement of nominees for the 35th Annual Helen Hayes Awards, which will be presented on Monday, May 13 at an event at the Anthem. Recognizing work from 208 eligible productions presented in the 2018 calendar year, 250 nominations were made in 47 categories and grouped in “Helen” or “Hayes” cohorts, depending on the number of Equity members involved in the production. Nominations are the result of 40 carefully vetted judges considering 2,866 individual pieces of work, such as design, direction, choreography, etc. Productions under consideration in 2018 included 51 musicals, 157 plays, and 54 world premieres. There are 24 nominations for eight productions in the Women’s Voices Theater Festival, which took place in early 2018 and featured new plays written by women. Those productions include: Aubergine by Julia Cho at Olney Theatre Center & Everyman Theatre, Digging up Dessa by Laura Schellhardt at The Kennedy Center, Familiar by Danai Gurira at Woolly Mammoth Theatre Company, The Lathe of Heaven by Natsu Onoda Power adapting from the book by Ursula K. Le Guin at Spooky Action Theater, Noura by Heather Raffo at Shakespeare Theatre Company, Queens Girl in Africa by Caleen Sinnette Jennings at Mosaic Theater Company of DC, The Trojan Women Project devised by the cast at Brave Spirits Theatre, and The Wolves by Sarah DeLappe at Studio Theatre. Four theatre companies – Annapolis Shakespeare Company, Brave Spirits Theatre, Compass Rose Theater, and Monumental Theatre Company (the 2018 Helen Hayes Award recipient of the John Aniello Award for Outstanding Emerging Theatre Company) – received nominations for the first time. And the overall number of productions nominated rose from 74 in 2018 to 88 in 2019 – a 19% increase. Arena Stage and 1st Stage saw the most number of nominations for a theatre, with 25 and 22 respectively. The most nominated productions include: The Wiz at Ford’s Theatre (with 13), Fly by Night at 1st Stage (with 9), Anything Goes at Arena Stage (with 8), Chicago at The Keegan Theatre (with 8), and Girlfriend at Signature Theatre (with 8). Named for actor Helen Hayes – a Washington native and legendary First Lady of the American Theatre – the Helen Hayes Awards has honored excellence in professional theatre throughout the Washington region for more than three decades. The administration and celebration of the Helen Hayes Awards is just one element of theatreWashington’s mission, which is to strengthen, represent, and support all segments of Washington’s professional theatre community, including theatre companies, artists, staff, and diverse audiences of all ages. Over more than three decades of support and advocacy, theatreWashington has played a vital role in the transformation of the city’s cultural identity, with the resulting revitalization of the whole community.